Falco Steel Fabricators Inc. is the continuance of a business started by the Falvo family in the early 70's. Later, under the leadership of Mr. Frank Falvo, the company was taken public and trading on the "Toronto Stock Exchange" under the name of "Falvo Corporation". The company produced a multitude of products ranging from a simple piece of handrail to multi-million dollar steel structures and major components for U.S. warships. In 1993, Mr. Falvo relinquished his control of "Falvo Corporation" and founded Falco Steel Fabricators Inc.
Falco Steel has a leading reputation in the industry for its quality products and timely delivery at competitive prices. The majority of our clients are well established, long time "Builder-Developers". 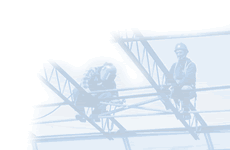 CANADIAN WELDING BUREAU [(Certified under division of Canadian Institute of Steel Construction (CISC)]. CWB Certified Under CSA Standard W47.1 ï¿½ ï¿½Certification of Companies for Fusion Welding of Steel Structuresï¿½, Division 2.1.